Delhi witnessed a classy event yesterday where the talk of the town was technology. We live in a world where we cannot even think a day without technology. So to be more precise, the event was on beaming LIVE videos. Yes, you read that right. 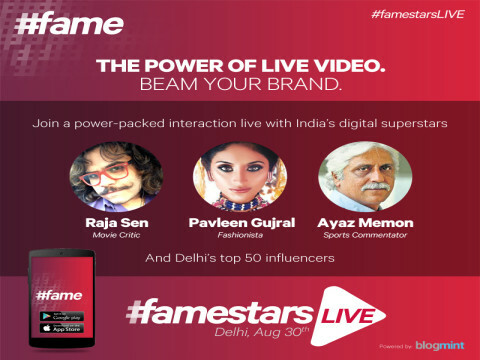 Beaming live videos is the next big thing and #famestarsLIVE event was all about that. In fact, it isn’t the future, IT’s NOW. The #fame app, as we all know, is a live video entertainment application, enabling the performers to beam their videos live to their audiences and effectively go global in one shot. It is a way to showcase your talent to the world, come into the limelight and achieve the desired #fame through the app. So, the event was on similar lines with a power packed interaction with the panelists, which included Ayaz Menon, a Sports Commentator, Pavleen Gujral, a Fashionista and Raja Sen, a Movie Critic along with Delhi’s top 50 influencers. The four hour long interactive session had panelists speaking about how live videos are the next big platform to market a brand in the digital space. The session threw some light on how some of the events of your business such as a keynote talk to shareholders or how the product is manufactured in the factory can be highlighted by beaming Live to your audience.The event threw light on the importance of real life videos and how it is changing the scenario in the entertainment business. It also highlighted how easy it can become to build a brand by simply showcasing the talent to the world. To help the representatives understand better, various case studies were discussed to highlight the power of live video such as, the 200 hours of live IIFA coverage, actor Shahid Kapoor’s wedding reception and various other bollywood events like trailer launches and celebrity chats along with the #fame app featured talents who enjoy a fan following of more than 10,000. Also, to make it interesting for everyone present at the event, the representatives were asked to download the #fame app to experience live streaming then and there. To experience and feel the power of live video, one of the #fame’s singing talent and #famestar, Abhiruchi Singh was beaming her show ‘Music on Demand’ live on the app and the people were asked to make like requests to the singer from the app. 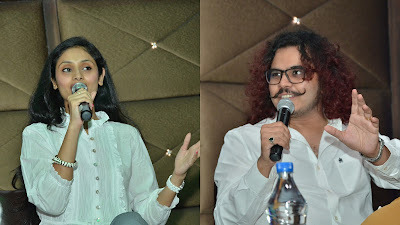 Later, she also shared her experience about how the #fame app is helping her in living her dream where sings from her home to the requests she receives on the app by unknown people and showcase the talent to the world. Not only this, she has also received a few offers from other #famestars to collaborate with other artists on the app itself. So as you see, the app effectively is more towards your success. Moreover, along with #fame as your key to stardom, we as bloggers can effectively market our views, through the app by going Live and directly interacting with the followers. Furthermore, the interaction also opened doors for VBlogging for those who didn’t find interest in VBlogging, such as me. Yes, pretty soon you will be seeing me on the #fame app, beaming live videos! With over more than one million downloads, 15,000+ unique performers and more than 35,000 live sessions #fame has definitely emerged as India’s no. 1 live video entertainment app. So in a nutshell, the #fame app is your key to superstardom. It primarily focuses on young talents to showcase their work and skills by creating a video and sharing it across platforms while building a fan-base around it. LIVE streaming your work or skills be it anything under the sun, such as singing, dancing, mimicking, cooking, partying, coloring, painting etc. is the thing. All you have to do is, talk about what you are going to cover in the video and simply beam live from your mobile. That’s it! There is no studio set up required too. There is also an option of live interaction with people watching the beam live, which makes it unique as well as engaging. So if you are young and talented or want to showcase your talent to the entire world, the #fame app is there to give you the wings to soar higher and higher.